Accra – Last weekend (28/07) IOM, the UN Migration Agency, joined Ghana’s Minister for Gender, Children and Social Protection and Interior; the US Ambassador; the UN Resident Coordinator; key government officials involved in anti-trafficking response; and civil society actors to celebrate the reopening of the only Government-owned shelter dedicated to child victims of trafficking in Ghana. The renovated shelter will be a safe and secure environment for children recently removed from human trafficking situations. Trained social workers can provide comprehensive and trauma-informed services and assistance, including psychosocial counselling, family tracing, and nutritional feeding. In total, IOM has provided over USD 50,000 to refurbish and refurnish the shelter. Through a regional initiative funded by the Kingdom of Sweden to improve direct assistance to child migrants, IOM supported the installation of a new septic tank and compound lighting, as well as funding renovations to the dayroom block, including two classrooms, an office, two staff toilets, a library and a storage room. Through funding from the the United States, IOM oversaw the renovation of two dormitory blocks and their adjacent bathrooms, as well as a dining hall and storage area. The organization also donated tables, benches, cabinets, mattresses, stoves, a freezer, a refrigerator, a television, mosquito nets and lamps. Support from the United States of America is part of the Child Protection Compact (CPC) Partnership between the Governments of Ghana and the United States, with funding from the US Department of State’s Office to Monitor and Combat Trafficking in Persons (TIP Office). As an implementing partner of the CPC, IOM provides technical support to Government stakeholders responsible for protecting victims of trafficking and prosecuting perpetrators. “As we celebrate this important achievement, we should not lose sight of the fact that the maintenance of the premises and of the new furniture, the scrupulous selection of the staff and above all, the quality of the care that is going to be provided to children in the shelter will be the real indicators of success,” said Sylvia Lopez-Ekra, IOM Chief of Mission in Ghana. 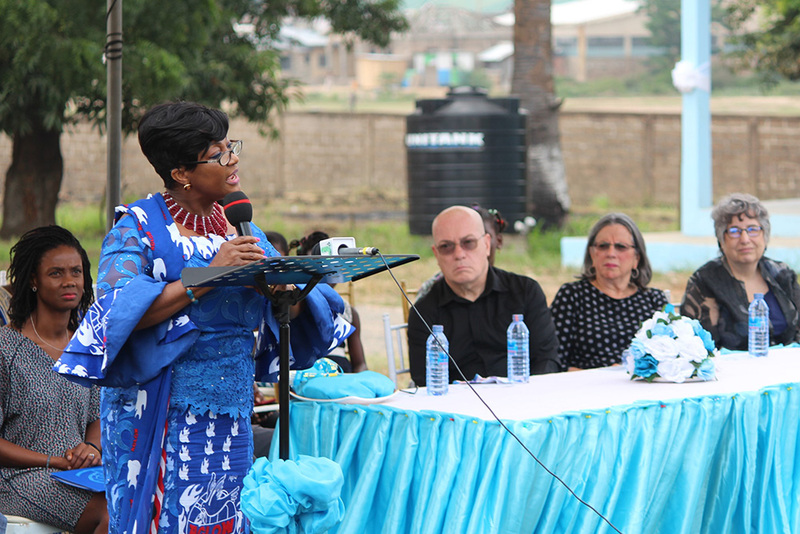 Through the CPC partnership, IOM also collaborates with the Government of Ghana to provide logistical support to law enforcement for operations involving child victims of trafficking and will assist those children who participate as witnesses in criminal proceedings.